Are you having difficulty in choosing your 2018 New Year Resolutions??? The career, volunteer and civilian men and women of the Prince George’s County Fire/Emergency Medical Services (EMS) Department (PGFD) have a few ideas for you. We recommend you adopt the TOP TEN Fire/EMS Department Smoke Alarm and Carbon Monoxide (CO) Detectors Resolutions for the New Year. These resolutions will help you stay compliant with the new 2018 State of Maryland Smoke Alarm Law and the County CO detector law. These are listed in no particular order, as they are all important. I will install 10-year, tamper proof with hush feature smoke alarms and CO detectors on every level of my home. I will check my smoke alarms and CO detectors on the first day of every month by pushing the test button on the front cover and listen for a warning signal. No sound = no protection. Not working?? Replace with a new 10-year smoke alarm or CO detector. I will check the manufacture date on my battery powered and hard-wired smoke alarms and CO detectors. If they are close to or have exceeded the 10-year life span I will replace with a new models. If I have a 9-volt powered alarm that is within 10 years of its manufacture date I will continue to provide fresh batteries twice a year and test monthly. Once the life span of 10-years is up I will replace with a new 10-year smoke alarm. The day you provide a fresh battery should be consistent each year; your birthday, your spouses birthday, your oldest child’s birthday, a holiday, change-your-clock/change your battery. I will designate one family member to be responsible for testing smoke alarms and CO detectors monthly. Everyone in the family should be made aware of the responsible person and reminders should be encouraged. Regardless of the type of alarm you have – test the alarm on the first day of every month. I will replace my smoke alarm and CO detector if it is 10 years old and than every 10 years after. A properly maintained smoke alarm works hard to protect you and your family every second of every day. The alarm wears out and is not as reliable as it was when you first installed it; replace it every ten years. I will include my smoke alarms and CO detectors when I perform household cleaning. Use a vacuum wand or clean rag to remove any dust that may have accumulated. Dust particles may affect the timely sounding of the alarm. I will install working 10-year, tamper proof with hush feature, smoke alarms and CO detectors on every level of my home. Most importantly is to have one in hallways outside of sleeping areas. I will install a working 10-year smoke alarm in bedrooms where my family members sleep with their bedroom doors closed. I will know and ensure my family knows what to do when a smoke alarm sounds – “get down, get low, get out.” Have a family escape plan and practice it to ensure everyone knows two ways out of every room in the house and designate a meeting place outside when 911 can be called in safety. A working smoke alarm provides you an early warning of a fire in your home. Your chances of surviving a fire in your home is increased by 50% by having a working smoke alarm. Having a family home escape planned and practiced increases your chances of survival even more. A working smoke alarm allows home occupants to escape safely and make a quick notification to the fire department equating to an earlier arrival and mitigation of the fire before it is allowed to spread thereby saving property and helping firefighters to stay safe and go home after every call. CO detectors are required by law if your home uses a gas to fuel your heat or to cook, has a fireplace and/or an attached garage. CO detectors are required on every level of your home. The Prince George's County Fire/EMS Department resolves to continue to provide the very best in Fire and Emergency Medical Services to our citizens, residents and visitors. We vow that if you call and say you need a new smoke alarm that we will come to your house and install a working smoke alarm for you and your family; free of charge. Call 311 and ask about our smoke alarm program. Freezing temperatures apparently will usher the week prior to our 2018 New Year and beyond this year. We would like to remind everyone that staying warm in your home without keeping "Safety First" is one of the leading causes of residential fires. Cold weather also could be unhealthy if you venture outdoors unprepared. The Prince George’s County Fire/Emergency Medical Services (EMS) Department (PGFD) is reminding everyone that home fires are more prevalent in cold weather than in any other time of the year. This is due in part to an increase in cooking and heating fires. This reminder involves the safe use of space heaters, general heating safety tips, hypothermia and frostbite prevention. The civilian, career and volunteer men and women of the Fire/EMS Department want to remind everyone that fire safety and prevention are especially important during times of cold temperatures. 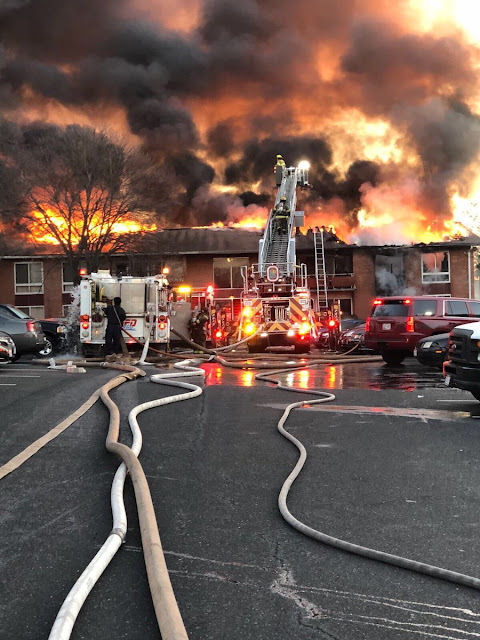 “Temperatures drop and fires increase,” said Prince George's County Fire Chief Benjamin M. Barksdale. According to NFPA statistics space heaters account for about one third of the home heating fires yet more than 80 percent of the home heating fire deaths. The Winter Residential Building Fires report released by USFA in 2010, reports an estimated 108,400 winter residential building fires occur annually in the United States, resulting in an estimated average of 945 deaths, 3,825 injuries, and $1.7 billion in property loss. Most notably, cooking and heating are the top causes of fires during cold weather. I hope everyone had a wonderful Christmas Day filled with love, joy, and laughter. As this holiday comes to a close I want to thank D shift and the many Volunteers who served our residents and visitors on this special day. I also appreciate all of those who turned in leave or made trades so that your co-worker could celebrate Christmas with their loved ones. We indeed have so much to be grateful for. I hope everyone took time to reflect how fortunate we are to work and volunteer in a profession that provides so much. Please continue to be stay safe for the remainder of the shift. On Saturday, December 23, Prince George's County Fire Chief Ben Barksdale led a contingent of public safety personnel to greet the displaced residents from a fire that occurred earlier in the week. The meeting was held at the Silver Hill Fire/EMS Station 829 on Old Silver Hill Road. On Tuesday at around 7:00 am, firefighters responded to Curtis Drive and encountered heavy fire conditions in a garden style apartment. The fire response required 2-alarms to complete extinguishment and overhaul the building. The same group of firefighters and medics that battled the fire that morning along with Public Safety Toys for Tots, Red Cross-National Capital Region, Fire Chiefs Community Advisory Council and the Silver Hill Volunteer Fire Department came together to provide the 21 adults and 12 children from 12 apartments to a bit of Holiday Cheer. Each child recede a bag of toys and each family unit received gift cards from the Community Advisory Council and the Silver Hill Volunteer Firefighters.